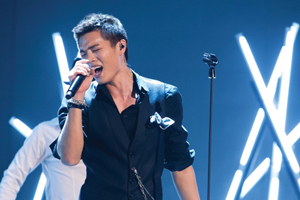 Jung-hwan Kim, a live show emcee selected by ‘Superstar K’ auditions after graduating from Berklee College of Music, sings passionately on the final round of Superstar K season 4. ‘Superstar K’, which has produced many renowned singers in Korea including Roy Kim and Dae-kwang Hong, is holding preliminary auditions on the 28th at 2pm, in the Fordham Road Practice Facility of Berklee College of Music. Although the main purpose of Superstar K’s visit to Boston is to recruit talented artists from Berklee College of Music, the audition is nevertheless still open to everyone. This might just be the best opportunity for the musicians in Boston who could not participate in the program because of limited resources and time. Participants who successfully pass the regional preliminary rounds are invited to Korea for the third preliminary round, which is judged by ‘Seung-chul Lee’ and other ‘Superstar K’ Season 5’s official judges. The participants who pass the third round will then participate in the ‘Super Week’ for 2 nights and 3 days, in which 100-150 selected teams are selected. After passing this stage, the musicians will finally compete for the ‘Superstar’ award and be broadcasted live. The final winner will not only win 450,000 dollars but also receive the honor of performing at Mnet Asia Music Award, the biggest music award festival in Asia. Additionally, the musician will produce a music video and sign a contract with a well-known entertainment company with the sponsor of ‘Superstar K’. The participants choose from many genres such as singing, dancing and playing instruments, as long as it can clearly convey their talent. ‘Superstar K’ 5 is holding other preliminary auditions in Los Angeles and Vancouver on the 25th and the 28th, respectively. The first episode of ‘Superstar K’ season 5 will be on air on August 9th 11pm.